Here’s the rainwater cistern from dream to (almost) done! Built with earthbags and a custom liner. This cistern, made of earthbags like the rest of the house, will be the primary source of water for the house. We’ll collect rainwater from the roofs of the house and the RV shelter (both of which will be metal). The water will be used for washing, bathing, and–after running through multiple stages of filtration–drinking. For more details visit Lily Ann Fouts blog. More about their earthbag house. I am a sustainability consultant, a rainwater catchment contractor and licensed to plumb rainwater into buildings by the State of Texas. 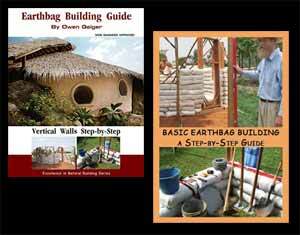 I am new to earthbag construction but I am looking for alternative methods to build water cisterns. We need large cisterns here in Central Texas due to long periods of no rain. I am very interested in building earthbag cisterns with liners. I have built several liner cisterns but I am wanting more stable builds for myself, friends and clients. 1. Can you bury earthbags up to 8-10 feet and then come up above ground? I am aiming for at least 10,000 gallon cisterns. 2. Do you need to use the white poly bags? 3. Can you use tubes instead of bags? 4. Can you lay bags against the dug walls or do you need to build them away from the walls and back fill? 5. If back filling, do you need to seal the outside of the bags with some kind of stucco? 6. Can you use the Raschel mesh tubes instead of white poly? 7. Do you need to stucco inside the cistern before installing the liner? 8. I read where you said crushed limestone would set up like cement inside the bags. Do you still consider this the best fill for the bags? Thanks for any help with this. I am excited with the possibilities. 1. Yes, if built correctly. Use stabilized fill material so any water leaks will not weaken the tank. Seal the outside with cement plaster and plastic sheeting. Best to grade the site to divert excess groundwater away from tank. 2. The color itself is not important. Just use standard (strong) poly sand bags or tubes. 3. Yes. This is what I recommend because construction will go faster. Many find it easiest to work with lengths of say 8′ or so. This also creates more overlap between joints which adds strength. 4. You need space to work: flatten the side, plaster, attach plastic sheeting. 5. Yes. Exterior plaster is always recommended. Poly bags deteriorate in sunlight in a few weeks. 6. They’re not as strong as poly so I’d only use raschel on smaller tanks. 7. It would give you an added layer of protection in case of leaks. So it is recommended if you can afford it. 8. It’s an excellent material if available. Always make sample earthbags and do tests. The next best choice is stabilized sandy soil or stabilized road base or even stabilized subsoil. My email is at the top of every page under About Us if you have further questions. This idea has excellent potential, especially if you have a source of affordable labor. Thanks for your prompt reply. I will digest the information. I have already read the instructable article you wrote. If we do some earthbag cisterns I will update you. This is a good cistern. Instead of plastic on the inside, just hang old carpet, then the liner. That would save a lot of time and material. Liner tanks can be made in a lot of ways, and burying at least the bottom 1/3 of the tank can allow you to build them fairly tall.